We get the newspaper (emphasis on paper) delivered every morning and will likely continue to do so until it ceases to exist or someone makes a reading device that plays well with food and liquids. I realize more often nowadays that I’ve drifted into the “get off my lawn” camp of the more experienced population, and I look back to previous generational shifts for perspective. A YouTube commercial (below) from the late 1950s caught my attention as I struggled to relate to the time of its creation. The “Live Better Electrically” campaign was launched in 1956 by the electrical industry (General Electric) to encourage homeowners to use more electricity. Print ads included checklist quizzes to rank your electrical prowess by how many appliances you had plugged in (the opposite of one you might see in today’s “green” campaigns). “Live Better Electrically Medallion Homes” were built and certified with all electric kitchens, washer/dryers and electric heat (much to the dismay of today’s occupants who wish they had gas lines running to their homes, especially in the cold months). Electricity is still fundamental to our modern lifestyles, but the idea of having one’s home awarded for (over)consumption runs counter to today’s culture. Perhaps an amazing energy discovery will lead us back to a time where nobody can recall being yelled at for leaving the lights on. Davidson Galleries in Seattle is running an exhibition of bookplates both contemporary and antique. Over 200 of these labels of book ownership are on display including those of well-known bookplate artists (yes, they exist!) who were, not surprisingly, usually printmakers. 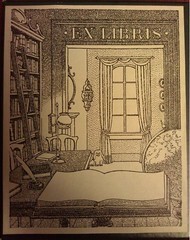 Bookplate subjects are as varied as their owners, though of course reading-related illustrations are common. My bookplates aren’t custom but they’re Laura Ashley (how luxe!) and I’ve only used them on a few very special books. Etsy is a good place to find bookplates to match your personality. I’ve written about bookplates twice before so here are some links I’ve gathered: Confessions of a Bookplate Junkie (still going strong after 5 years), The American Society of Bookplate Collectors & Designers, The Bookplate Society, University of Notre Dame’s Bookplate Registry project, and Stanford’s online Bookplates Exhibit. There are many more bookplate resources out there and collections at many universities.